One of the most striking gaps in both popular and academic writing on media in South Asia relates to the question of relationships between media institutions. And this is especially relevant in the Indian context given the extent and range of film content that shapes radio, TV, the Internet, mobile, and increasingly, video games. This question shapes my research in important ways, and I am particularly interested in mapping the film industry’s relationship with radio during the first decade of independence. While waiting for inter-library loan materials (such as “Indian Listener,” an All India Radio publication) to arrive, I decided to look into newspaper coverage and came across a number of interesting articles and advertisements that provide glimpses not just into how the airwaves became a key site for elites to define “national culture,” but also some sense of the rhythms of everyday life during the 1950s. I will post images and snippets of articles as I work through them over the next few weeks, but to begin with, here is an excerpt from October 3, 1957 (The Hindu) that caught my attention right away. I could not have asked for anything better – the juxtaposition of All India Radio’s broadcast schedule with an ad from Radio Ceylon (run from Colombo) speaks very directly to the ways in which the commercially operated radio station from Colombo challenged the nationalist elites at All India Radio who, after nearly a decade of obstinacy, relented and allowed the broadcast of film music and other “light music” on All India Radio. As the story goes, All India Radio had banned “vulgar” film music arguing that it was critical to cultivate the tastes of the Indian “masses” by exposing them to classical music from both south and north India. Radio Ceylon, run on a commercial basis, spotted an opportunity and launched a number of programmes that revolved around film and film music, the most famous one being a countdown show sponsored by Binaca and hosted by Ameen Sayani (Binaca Geet Mala). If you click on the excerpt above and look a bit closer at the broadcast schedule on All India Radio, you will notice that listeners in Madras (now Chennai) who tuned into All India Radio could listen to a violin concert followed by Russian orchestra music. However, if they had purchased a radio set that was equipped to receive shortwave signals, they could tune into Radio Ceylon and listen to Shakeel Badayuni, a renowned poet and film lyricist (more here), and famous playback singers like Mukesh and Talat Mahmood. And this is precisely what listeners in India did – for nearly a decade, each evening, they gathered around radio sets to listen to film music from Bombay being broadcast from Ceylon. An “Indian public/audience” was forged, to the surprise of bureaucrats at All India Radio, by a small overseas programming division of a broadcasting station from a neighboring country with the help of the film industry in Bombay. Moreoever, many of these shows were sponsored by companies based in Bombay and other cities in India that could not advertise on the state-controlled, non-commercial All India Radio (in this instance, the company sponsoring the show is Sanforized – Sanforized ke Mehmaan translates to Sanforized’s Guests). 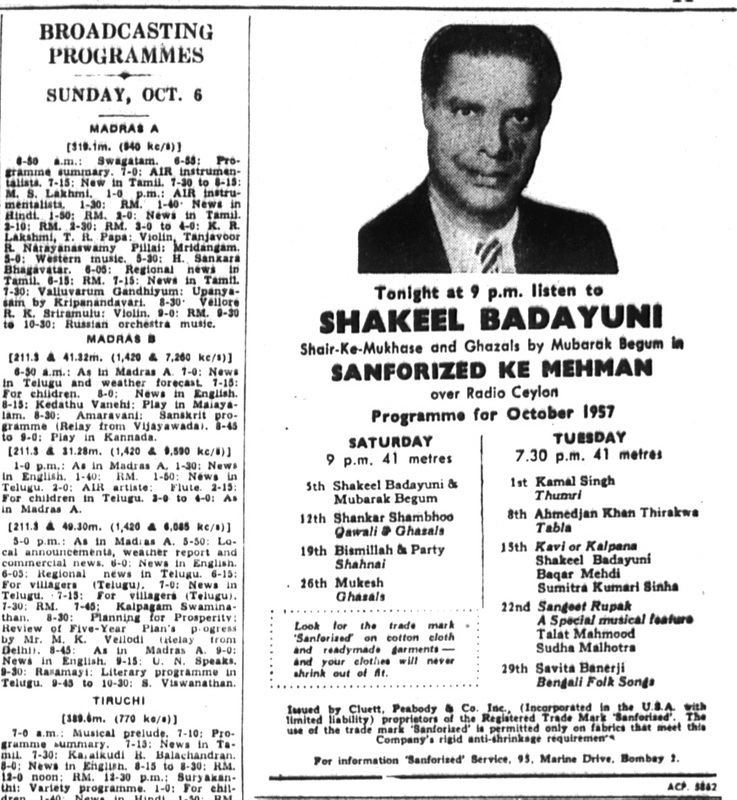 And these shows served as a template for producers at Vividh Bharati as they launched their programmes in October 1957. Needless to say, I’ve only scratched the surface here. Over the next few weeks, I will return to this moment of media convergence and transnational flows (Radio Ceylon could be picked up in Southeast Asia and as far west as the east coast of Africa) with, of course, fascinating archival material. Stay tuned! You are currently browsing the BollySpace 2.0 blog archives for January, 2008.